What does the figure of David Moyes tell us about him as a person? First of all, let us make a clear distinction between his two tenures as football manger: Everton and post-Everton. 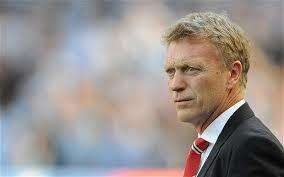 His two tenures do confirm that Moyes is worthy of the epithet 'Brooding Dave.' The difference between the two tenures is very simple - it is one of confidence. Moyes has always been static and immobile whilst on the dugout. Beyond those blue, cavernous eyes we can positively ascertain that he is a passionate, glum and solemn figure. He cares about one thing and one thing only: football. His unrelenting energy is driven towards that direction. His mind is racing. He is not thinking about sophisticated tactics. His mind, on the contrary, works on rather binary terms: win/lose. The outcome of a football game determines the outcome of his feelings and his frame of mind. Although not sophisticated when it comes to tactics, he knows that he can transfer his passion onto the players. He has grit and his team plays with grit. He is hard-working and team play with a similar ethic. Hence, they are organised and tough to beat. Moysie is a working class kid from Glasgow. We can see this when we look at him. We can see that he has been marked by his upbringing. We can see that as he statically stands in the rain, bellowing instructions at his players. His upbringing has informed his values. Hence, he is a Methodist and a Labour supporter. Beyond that, he only cares about his football. We can see that as he stand on touchline. He is tenacity personified. Once he moved to global multi-billionaire extravaganza that is Mancherster United, things changed for Moysie. He continues to brood, as is his wont. Except that he now cuts a rather glum, flummoxed and confused figure. He is overwhelmed by the new circumstances. He frequently scratches his head, dumbfounded. He is no longer fighting against the current as an underdog. He has all the resources at his disposal. Nevertheless, the circumstances are not propitious for Moysie. As such, he looks miserable and terrified. Will the tenacious Moyes make a come-back? Sadly, Moyes seems to think that he is more flexible and talented than he actually is. He is suitable for a team with a mid-table budget vying for Europe. Beyond that he cannot manage a global monolith like Man U, nor a Liga team like Real Sociedad. He needs to fight against the current. He needs to be in miserable circusmtances. Otherwise, wonderful circumstances make him miserable. Hopefully, he will come to his wits and realise that he a lot more parochial and one-dimensional than he thinks himself to be. We need the real David Moyes back on these shores.